View the main iWatch news blotter for information on major incidents in the County. View the Dundalk precinct news blotter. Learn more about County crime trends and statistics. Learn how to submit online tips about criminal activity. Residents should call 911 in case of an emergency. Are you going out of town? Don't leave your home looking unoccupied. Complete a Vacant House Form (PDF) and email it to the precinct's Community Outreach Team. Officers will then check on your location for any unusual activity while you are away. Thanks to community involvement the suspect who stole a man's wallet after he left it at the checkout counter at Quick Mart in Dundalk has turned himself in to police. He is identified as Joseph Scott Weber (26) of the 16000 block of Old York Road, 21111. He is charged on a summons to court with one count of theft $100 - $1,500 and faces trial in June. 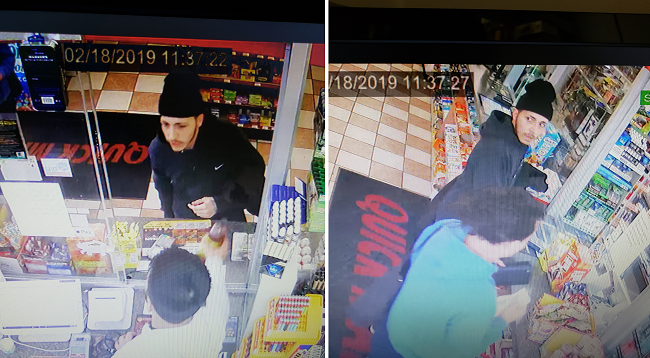 Baltimore County Police need help identifying this suspect who stole an elderly man's wallet right off the counter at Quick Mart on Trappe Road in Dundalk. Store surveillance video shows the victim standing at the counter making a lottery ticket purchase, and laying his wallet down. He finishes his purchase and walks away, forgetting to pick up the wallet. The suspect walks up to the counter immediately after, picks up and conceals the wallet, moves to the open register window to pay for a drink, and leaves. He left the area on foot, walking up Trappe Road toward Wallford Drive. Now police are asking anyone who recognizes this deplorable thief to contact the investigating officer, Officer Snee #6098, with information at 410-887-7320. At 1 p.m., the victim was getting into her vehicle when the suspect pushed her and threw her into the vehicle. The suspect took the victim's wallet and ran away. The suspect was found and arrested. View the Local Blotter for the Dundalk Precinct for the latest news on crime in your area. Captain Glen Wiedeck is a 29-year veteran of the Baltimore County Police Department. He started his law enforcement career in 1989 as a patrol officer in Dundalk. He worked uniform patrol for six years before becoming a detective in the Criminal Investigations Bureau. In 1992, Captain Wiedeck was selected to join the Hostage Negotiations Team. He worked tirelessly to peacefully resolve critical incidents and help people in crisis for 15 years, ultimately becoming the assistant team commander until his departure in 2007. He transferred to the Narcotics Unit as a detective in 1995. He remained in the Narcotics Unit until he was promoted to the rank of corporal in July 2002 and assigned to the White Marsh Precinct. He worked as a patrol supervisor until June 2003 when he was transferred to supervise the White Marsh Precinct Community Drug/Violence Interdiction Team. Captain Wiedeck was promoted to the rank of sergeant in January 2005 and assigned as a patrol supervisor in the Essex Precinct. He was assigned to the Crimes Against Children Unit in January 2006 as a detective sergeant and then later promoted to the rank of detective lieutenant and assumed command of the Regional Auto Theft Task Force. Captain Wiedeck was later transferred back to the Crimes Against Children Unit as the unit commander. While assigned to the Crimes Against Children Unit as both a sergeant and lieutenant, he had the opportunity to work closely with the Baltimore County Departments of Social Services and Health toward the common goal of protecting children. Captain Wiedeck is excited about the opportunity to work in the same area where he started as a young patrol officer 29 years ago to help reduce crime and improve the quality of life for citizens. Captain Wiedeck strongly supports the departmental values of Integrity, Fairness and Service and will work hard to reinforce those values in his assignment as the commander of the Dundalk Precinct, which began February 1.